Coming soon: The Pour House (across from Eva) on the corner of N. 56th St. and Kirkwood Place. 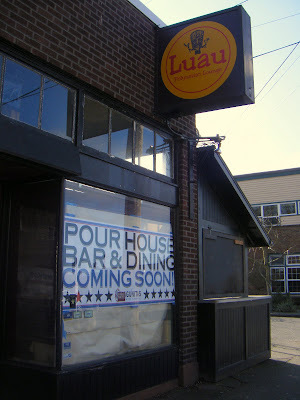 Luau has seen a series of ownership and management changes in the 15 years since Thomas and Jessica Price opened their popular drinks-stop and pupu parlor near Green Lake. The Price’s former business-partner Tony Boitano — who took the helm in 2005 — turned the keys over to new owners Jay Farias and Erik Knutson two weeks ago. “We’re deep into a remodel,” says Farias, who expects to re-open as Pour House Bar & Dining by mid-March. Contractors are already hard at it, sandblasting and acid-staining the floor, cutting “windows” into the wall between the bar and the Bora Bora Room. They’ll be pulling out the bar’s rail and making the main space 21-and-over, with the smaller dining area available for families.